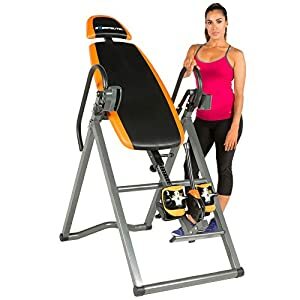 You simply have to look at the buyer reviews to see that the Teeter EP-560 Ltd inversion table is one of the best inversion tables available. 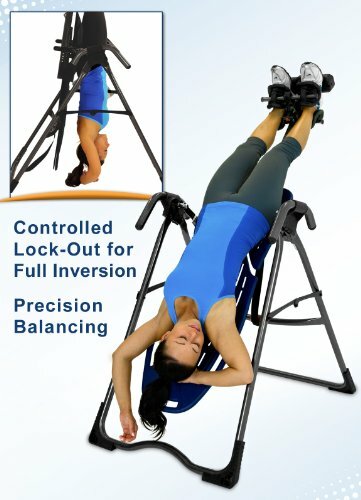 For many who are experienced with inversion therapy, the Teeter range are often their “go to” tables of choice. The main reason for this is often due to the high quality inversion tables Teeter produce. The brand Teeter have been around for a great deal of time and their products are very highly regarded, always gaining very good user reviews. The EP-560 inversion table has a recommended weight capacity of 300 lbs and is suitable for users who fall within the heights of 4 ft 8″ to 6 ft 6 “. One of the main questions that often comes up is, what is the difference between the EP-560 and the EP-960 inversion table from Teeter? We will look into the main differences more further down the page. If however, you are looking for a quick answer, the EP-960 features extra long side handles, traction handles and an extra long patented ankle lock handle. The Ep-960 is also a little more pricey due to the additional features. Another question asked is, what is the difference between the standard EP-560 and the EP-560 Ltd model? Both the standard and Ltd models are exactly the same, however in the Ltd package you will receive acupressure nodes and a lumbar support bridge. These accessories can also be bought separately. We will look into these accessories further down the page so you can decide if they would be useful for you. If you decide the nodes and lumbar bridge are not necessary, you can click through to the retailer to view the standard EP-560 model. 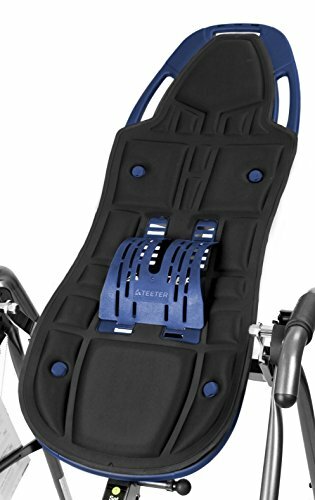 One of the best things about the EP range of inversion tables from Teeter, is the patented ComforTrak backrest. The backrest is fairly unique since it has 3 additional stretching handles that are in built in to the backboard. As you can see in the image to the right the bed area features a grip handle at the top of the backrest and two handles either side of the black padded headrest. In addition to these useful stretch handles you can also see the the numerous ridges on the backrest which allow you to customize your Teeter table with accessories such as the lumbar bridge and acupressure nodes (also pictured on the board). Some may wonder why Teeter inversion tables opt for this style of backrest rather than a padded bed area. The reason for this design is to make spinal decompression more effective. The smooth surface of the backrest allows the user to slide down while inverting with minimal resistance. On a padded inversion table you may find you sink down into the padding (especially if you are not inverting at a great enough angle) which causes more resistance. With the Teeter you can slide down the table effortlessly and get a great body stretch. You also have the choice of adding the Teeter comfort cushion to the backrest (pictured right), should you prefer to add a little padding. Please note that the comfort cushion is sold separately and not inclusive in the standard or limited package. For anyone worried that the plastic bed on the Teeter models may not be as comfortable as some of the memory foam padded backrests on other inversion tables. We would recommend taking a look in the buyer reviews in the next tab, you will soon see that no one complains about the comfort provided by this style of bed. As you can see in the image to the right when you compare the side handles on the EP-560 and 560 Ltd model to other inversion tables they are fairly short and small. Most inversion tables including the Teeter EP-960 feature very long side handles that can be used for additional help when inverting. If you look at other tables you will soon see the EP-560 is one of the only inversion tables with side handles this small. So is this a negative feature? It is safe to assume some users could find this off putting depending on their level of experience. Over the years I found I used the side handles less and less on my inversion table. As my confidence using the table grew I found was able to control the table simply by shifting my body and using my arms without having to rely on the side handles for assistance. However I would say longer side handles are a more preferable option. 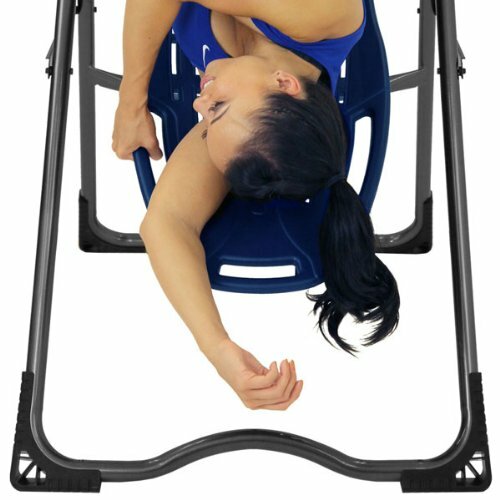 If you are not too experienced with inversion therapy but would like a Teeter inversion table, the EP-960 is probably a better choice for you. Or the “EP-560 with back pain relief set” also features extra long side handles, you can view this table on visiting the retailer. The extra long side handles are very useful especially when starting out or if you lack confidence when using an inversion table. The additional traction handles on the EP-960 are a nice addition for additional stretching and rhythmic oscillation. They are not present however on this, the EP-560 model but they can be bought separately and added to the EP-560. There are also plenty of other stretching options on the 560 model, such as the backrest grips (already mentioned) and the raised curve on the rear floor rest (pictured right). Both the EP-560 and the EP-960 feature cupped ankle grips to comfortably and securely hold your ankles in place. The difference between the two models is the ankle lock device. Whereas the EP-560 features a fairly standard spring pin device, the EP-960 features an extra long easy to reach lever. Whether the extra long lever is necessary for you, depends mainly on how easy it is for you to bend down when securing your ankles. Many may find the extra long ankle handle is not overly necessary, however if you lack flexibility or want to reduce the chance of straining your back then a table with a long ankle lever may be a better option! 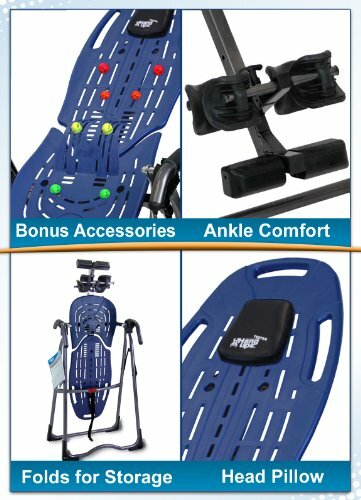 The colorful acupressure nodes and lumbar bridge can both be purchased separately or you can get them included should you opt for the EP-560 Ltd from Teeter. The lumbar bridge is a very nice addition not found on many other inversion tables. The Teeter lumbar bridge is ideal for adding support and providing deeper decompression to the lower back area whilst you invert. You can even adjust the lumbar bridge to protrude more outwards from the table or have it provide a more subtle curve to suit your preference. As you can see in the image (bonus accessories, right), the backrest features various indents below and above the bridge support to allow for curve adjustments. The 8 colorful acupressure nodes can also be placed throughout various locations on the ComforTrak bed. They can also be placed on the lumbar bridge as the bridge also contains the necessary placement slots. While upon the bed you can shift your weight around the acupressure nodes to provide a shiatsu style massage sensation, or simply rest on the nodes and maintain steady pressure. 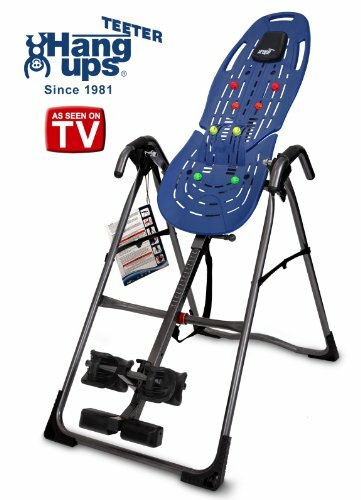 Is the Teeter EP-560 Inversion table a good choice? Generally speaking any inversion table released from the Teeter camp is going to be a very good choice, however some models will be more preferable to certain users. As we have pointed out earlier in this page the EP-560 lacks some of the features included on the EP-960. The most notable feature being the long side handles that are not found on the EP-560 or EP-560 LTD. If you are happy with the absence of long side handles, then (like all Teeter tables) the EP-560 is a very good choice of inversion table. However if having long side handles is an important feature for you to have, the EP-560 and EP-560 LTD models may not be for you. When it comes to comfort, efficiency, ease of assembly and quality Teeter inversion tables are hard to beat. 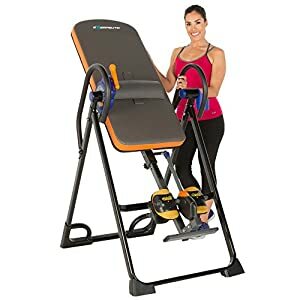 Due to the excellent quality, many buyers feel the Teeter EP-560 inversion table is great value for money, despite its slightly higher price when compared to other brands. 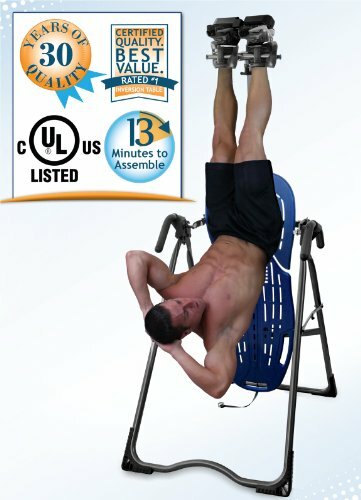 If you are on the fence as to whether the EP-560 inversion table is a good choice for you, we would suggest taking a look at some of the buyer reviews in the next tab. You will soon see numerous reasons why the Teeter brand is considered to be one of the best when it comes to making inversion tables. 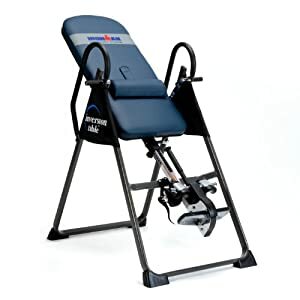 Overall the Teeter EP-560 is a great inversion table to consider which has a lot going for it. The only real negative is the short side handles, which may make this table a little less appealing to the less agile and to those new to inversion.